I had tarragon on the brain. 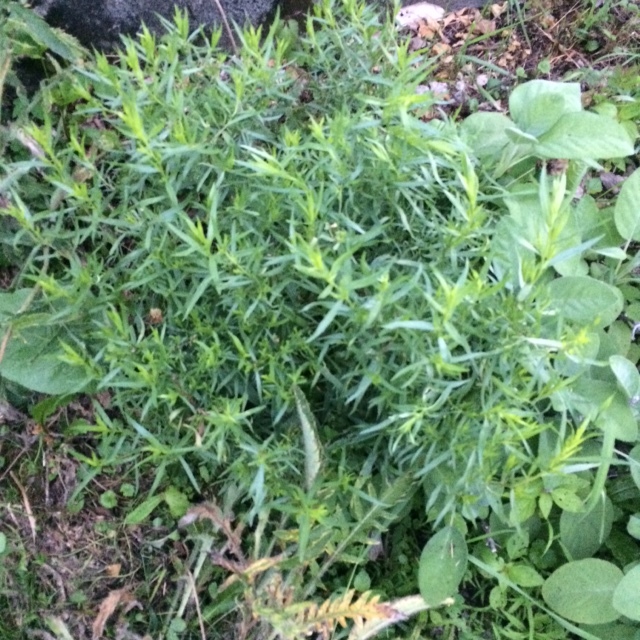 We have a perennial patch of tarragon upstate, and this summer, it has produced like no other year. Normally, I have to constrain Kathryn from pillaging the entire clump in one go, but no such worries with this batch. One of my favorite summer dishes happens to be roast tarragon chicken, and this was my objective/obsession as I started my vacation week upstate, preceding the 4th of July holiday. 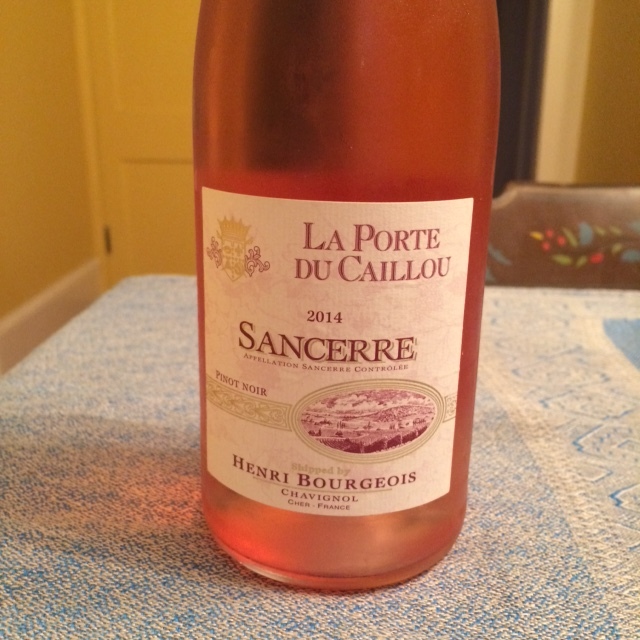 And I already had the (notionally) perfect wine on hand: the 2014 La Porte du Caillou Sancerre Rosé from Henri Bourgeois (100% Pinot Noir), a Loire standout, imported and distributed by the estimable Monsieur Touton. My plans were quickly foiled, however. The fresh, natural chicken quarters I often buy at the local health food store didn’t arrive as scheduled; as it was already late Monday afternoon, frozen poultry wasn’t an option. I searched around and spied a different, but tantalizing choice: Merguez lamb sausages from D’Artagnan. 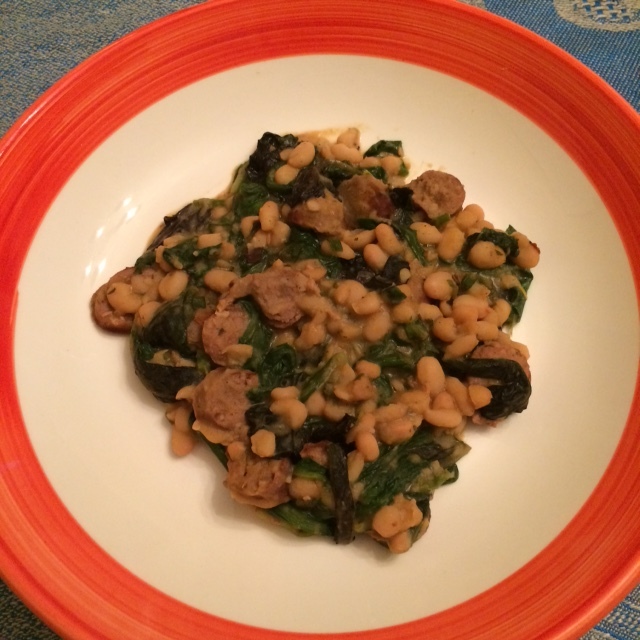 One of my go-to, one pot dishes is a combination of organic white beans (Eden Navy or Great Northern), garlic and herbs, greens (usually mustard) and sliced up Merguez sausage. The bonus in the summer is that the herbs and “green garlic” (scapes) come right from our garden. So, after cooking the harrisa-inflected Merguez in our Le Creuset dutch oven (sautéed stove-top two minutes each side, and then finished in the oven for 4-5 minutes at 375 degrees), and pouring off the excess rendered fat, I added chopped fresh tarragon, garlic scapes and sage to the pot, and sautéed for 30 seconds; put in the greens and a can of organic navy beans, along with a good teaspoon of sea salt, a palm-full of Herbs de Provence and dash of ground black pepper, cooking until the greens were wilted; and then added two sliced up Merguez sausages to the mix (with occasional splashes of water to scrap the bottom of the pot). It’s a delicious, no-fail dish. The conundrum: would the pink hold up to the hearty dish? First, the La Porte du Caillou (which I found at Sipperly’s in Red Hook, NY) is not just a forgettable pool-side rosé: a pretty light salmon orange, it has intense black raspberry fruit, herbs and mineral nuance on the nose, which is mirrored on the palate, with zesty acidity and length, finishing bone dry. It’s top-notch (around $18.00). 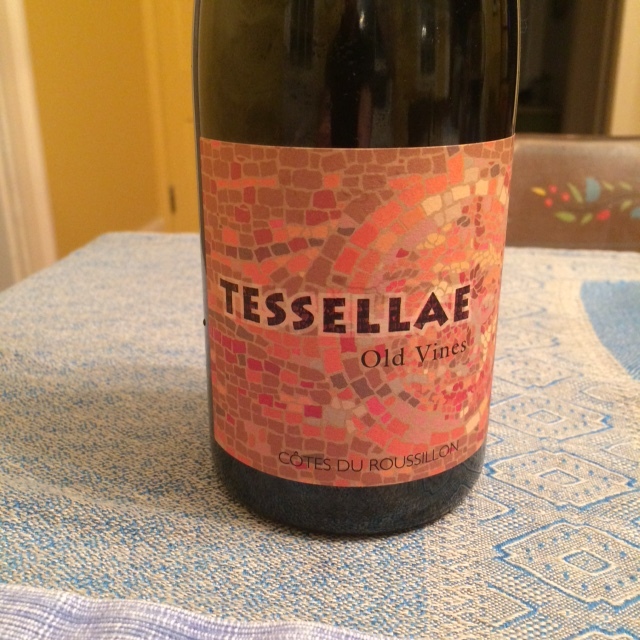 This entry was posted in At Our Farmhouse, Food, Wine, Wine + Food and tagged 2012 "Tessellae" Cotes du Roussillion, 2014 La Porte du Caillou Sancerre Rose, Eric Solomon Selections, Henri Bourgeois, Loire Valley wine, Merguez sausage, Monsieur Touton, Sipperly's Grog Shop, tarragon. Bookmark the permalink.